JSPS offers several international programs which respond to a variety of needs of Asian countries, such as supporting international joint research, inviting researchers to Japan from overseas, and fostering young researchers who will play active roles in the global arena. The brief overview of applicable programs is listed as follows. Please visit JSPS’s website for details. You can check the suitable program. Let's chek it! JSPS promotes international scientific exchanges between Japan and counterpart countries in accordance with agreements or memoranda of understanding concluded with academies, research councils and other science-promotion organizations in those countries. Programs with such partner agencies mainly take the form of joint research projects, joint seminars and researcher exchanges. Proposals for bilateral programs are openly recruited; and, per agreement with the partner agency, are jointly selected and supported. Researchers belong to counterpart country are required to submit their applications to counterpart organizations. Japanese and counterpart team leaders should be sure that their counterpart submits a matching application. Applications submitted by one side only will not be accepted. For further instruction, please ask for counterparts’ organization. Please note that some counterpart organizations limit the fields of application. Please see the program guidelines in detail. In addition to joint research projects/seminars with counterpart organizations, JSPS has another scheme for joint projects/seminars named “Open Partnership Joint Projects/Seminars” from FY2013 that provides Japanese researchers an opportunity to do a joint research project or a seminar with researchers around the world who reside in a country that has diplomatic relations with Japan, plus Taiwan and Palestine. Counterpart researchers are encouraged to secure their own funding in their own countries. All fields of the humanities, social sciences and natural sciences are included under this program. Some counterpart organizations limit the fields of application. JSPS supports international domestic travel expenses, other expenses, and meeting expenses for joint seminar of researchers on the Japanese team. Counterpart organizations support expenses on their countries’ team. Each institution may provide expenses necessary for stay for both side researchers during their stay in its country when such arrangement has been mutually agreed upon. *This deadline is for the head of the host institution to submit the application to JSPS. All countries that have diplomatic relations with Japan plus Taiwan and Palestine. However, applicants who wish to implement a project/seminar with an eligible country under “A Bilateral Joint Projects/Seminars with JSPS’s Counterpart Institutions” are recommended to apply under that scheme. All fields of the humanities, social sciences and natural sciences are included under this program. JSPS supports international domestic travel expenses, other expenses, and meeting expenses for joint seminar of researchers only on the Japanese team. Counterpart researchers are encouraged to secure their own funding in their own countries. 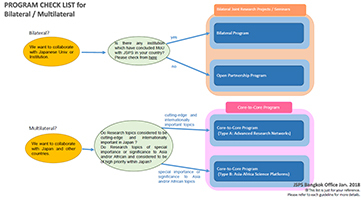 Since FY 2012, JSPS has implemented Core-to-Core Program, comprising two components: (1) Advanced Research Networks and (2) Asia-Africa Science Platforms. This program is designed to create top world-class research centers that partner over the long term with other core research institutions around the world in advancing research in leading-edge fields, on issues of high international priority, and in areas that contribute to the solution of prevailing problems in the Asia-African regions. While advancing research in these fields and building core research and education hubs in the Asia and Africa, the Core-to-Core Program also concentrates on fostering the next generations of trailblazing young researchers. *Each counterpart institutions must provide their own project funding equivalent to JSPS’s project grant. 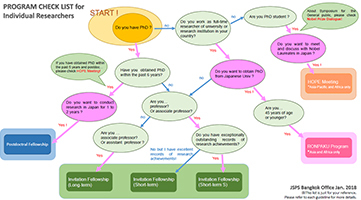 The fellowship’s purpose is to provide opportunities for young and excellent postdoctoral researchers from other countries to conduct, under the guidance of their Japanese hosts, cooperative research with leading research groups in universities and other Japanese institutions. The program allows such researchers to advance their own research while contributing to the progress of research in Japan and the counterpart countries. Applications for this program are submitted by a host researcher in Japan who wishes to host a foreign postdoctoral fellow. Fellowships are awarded for a period of 12 to 24 months. Hold a doctorate degree when the Fellowship goes into effect, which must have been received within 6 years, or be scheduled to receive a doctorate degree before the Fellowship goes into effect. Settling-in allowance of 200,000 JPY, Overseas travel accident and sickness insurance coverage, etc. Grant-In-Aid for Scientific Research (Tokubetsu Kenkyuin Shorei-hi) of up to 1,500,000 JPY per year (total of 3,000,000 JPY for two years) is available to cover cooperative research-related expenses. *The amounts of the Awards indicated below are subject to change for budgetary reasons. 2nd Recruitment: May *These deadlines are for the head of the host institution to submit the application to JSPS; the time frames for applicants (host researchers) to submit their applications are normally earlier. This program is designed to enable Japanese researchers to invite their foreign colleagues to Japan to participate in cooperative work and other academic activities. Applications are submitted by the inviting researchers who wish to host foreign researchers in Japan. Research support allowance of up to 150,000 JPY is available to cover cooperative research-related expenses. Short-term S Invite overseas researchers with eminent records of research achievements to Japan. Long-term - Hold a full-time position in an overseas research institution. - Overseas researchers in a position equivalent to a university professor, associate professor or assistant professor in Japan as of 1 April of the starting year of fellowship tenure. Short-term - Hold a full-time position in an overseas research institution. - Overseas researchers in a position equivalent to a university professor or associate professor as of 1 April of the starting year of fellowship tenure. Short-term S - Overseas researchers who are Nobel laureates or recipients of similarly high-level international prizes with exceptionally outstanding records of research achievements and who currently occupy a leading position in their subject field. Short-term, Short-term S: September and May *These deadlines are for the head of the host institution to submit the application to JSPS; the time frames for applicants (host researchers) to submit their applications are normally earlier. The aim of JSPS RONPAKU (Dissertation PhD) Program is to provide tutorial and financial support for promising researchers in Asia and Africa or other specified countries who wish to obtain their Ph.D. degrees from Japanese universities through the submission of a dissertation without matriculating a doctoral course. Please check eligible countries at website. Notes: From FY2015 call, JSPS does not require applicants to submit recommendation letters from nominating organizations. already holds a full-time position as a researcher in a university or research institution in his/her home country or will likely be appointed to such a position by 1 April of the starting year of the fellowship is under 45 years of age as of 1 April of the starting year of the fellowship. Further eligibility requirements for this program are provided in the Application Guidelines. Travel expenses between Japan and RONPAKU fellow’s home country, and within Japan by the fellow and his/her Japanese advisors; expenses incurred in conducting research in Japan and fellow’s home country; and other expenses related to the fellow’s dissertation submission (based on Japanese host university’s regulations), etc. *Each fiscal year, at least 70% of total funding must be used for travel expenses. HOPE Meetings give opportunities for excellent doctoral students and young researchers selected from countries/areas in the region to engage in interdisciplinary discussions with Nobel laureates and other distinguished scientists. Their programs include dialogue with distinguished scientists pioneering the frontiers of knowledge; exchanges among the participants themselves, who live under the same roof for one week; and cultural lectures and activities. It is an open symposium aimed at stimulating discussion between world’s leading researchers and intellectuals, including the Nobel laureates, and the general public. (1) To foster public interest in science and technology. (2) To contribute to the advancement of science and technology. For these purposes, we will invite world’s leading scientists, including Nobel laureates, to carry out a dialogue via a format of open lectures and panel discussions with the general public, including students and young researchers.